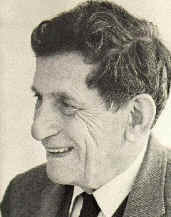 David Bohm was born in Pennsylvania in 1917 and died in England in 1992. He was a quantum physicist and philosopher; a contemporary of Einstein and a student of Openheimer. He was probably one of the most original thinkers of the second half of the twentieth century. He was the inspiration behind the current practice of dialogue and a founder of MIT's dialogue project. It is clear that if we are to live in harmony with ourselves and with nature, we need to be able to communicate freely in a creative movement in which no one permanently holds to or otherwise defends his own ideas. Why then is it so difficult actually to bring about such communication? This is a very complex and subtle question. But it may perhaps be said that when one comes to do something (and not merely to talk about it or think about it), one tends to believe that one *already is* listening to the other person in a proper way. It seems then that the main trouble is that the other person is the one who is prejudiced and not listening. After all, it is easy for each one of us to see that other people are "blocked" about certain questions, so that without being aware of it, they are avoiding the confrontation of contradictions in certain ideas that may be extremely dear to them. The very nature of such a "block" is, however, that it is a kind of insensitivity or "anesthesia" about one's own contradictions. Evidently then, what is crucial is to be aware of the nature of one's own "blocks." If one is alert and attentive, he can see for example that whenever certain questions arise, there are fleeting sensations of fear, which push him away from consideration of these questions, and of pleasure, which attract his thoughts and cause him to be occupied with other questions. So one is able to keep away from whatever it is that he thinks may disturb him. And as a result he can be subtly defending his own ideas, when he supposes that he is really listening to what other people have to say. When we come together to talk, or otherwise to act in common, can each one of us be aware of the subtle fear and pleasure sensations that "block" his ability to listen freely? Without this awareness, the injunction to listen to the whole of what is said will have little meaning. But if each one of us can give full attention to what is actually "blocking" communication while he is also attending properly to the content of what is communicated, then we may be able to create something new between us, something of very special significance for bringing to an end the at present insoluble problems of the individual and society. Suppose we were able to share meanings freely without a compulsive urge to impose our view or conform to those of others and without distortion and self-deception. Would this not constitute a real revolution in culture.